Carolrhoda Books (R), 9781606845134, 182pp. A hilarious middle-grade novel about a misunderstood caveboy perfect for fans of Ice Age and Happy Feet. Lug is a caveboy who would rather paint than club other caveboys. The clan even mocks him, calling him "Little Slug." Like all the other caveboys, Lug must enter the contest to become the clan's next Big Man and attempt to catch the Biggest Beast--even though he would much rather spend his days painting in his secret art cave. When Lug is banished for failing to catch a jungle llama, he thinks he is alone in the world but finds others who believe in him: his clanmate Stony, and a new friend, Echo, a girl from a rival clan who can talk to animals and just may be prehistory's first vegetarian/animal rights activist. Together they face even bigger challenges--Lug discovers the Ice Age is coming and he has to bring the warring clans together to save them not only from the freeze but also from a particularly unpleasant migrating pride of saber-toothed tigers. It's no help that the elders are cavemen who can't seem to get the concept of climate change through their thick skulls. 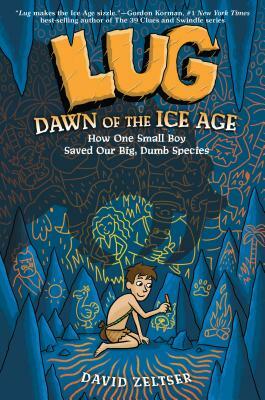 With funny, anachronistic humor and charming characters, Lug, Dawn of the Ice Age is sure to be a hit with many readers. David Zeltser's upcoming books include LUG--book 2 (Egmont, 2015) and NINJA BABY (Chronicle Books, 2015). David also writes screenplays and performs improv comedy. After graduating from Harvard, he worked with all kinds of wild animals, including owls, rhinos, sharks and ad executives. He now lives in Santa Cruz, California, with his family and many barking sea lions. Check out all of David's books and adventures onwww.davidzeltser.com, Facebook and Twitter @davidzeltser."